Having finished off the 2016 master-level commentary games, I'll turn back now to looking at my tournament games. At first glance this 19-move draw seems pretty worthless, but in fact analyzing it really gave me some insights into some key mechanics of the Classical Caro-Kann setup, especially how Black should coordinate the pieces - note the uselessness and even the liability that the Bd6 proved to be here - and think prophylactically (11...b5!?). The opening itself veers out of book early on (moves 6-7), something I did not handle very well. My opponent was rated significantly below me, but played well and I had the worst of a position with no prospects, so the draw was probably the best outcome. 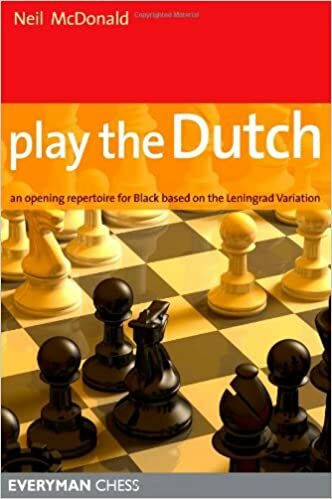 I recently completed Play the Dutch by GM Neil McDonald (Everyman Chess, 2010), which per the book's subtitle is "an opening repertoire for Black based on the Leningrad Variation". It is also a direct follow-up to his Starting Out: The Dutch Defence which provides an orientation to all of the main Dutch variations (Stonewall, Classical and Leningrad). The "Play the..." series of books are intended to be more focused and intermediate versions of the "Starting Out..." openings series from Everyman. The book is very reader-friendly, both in terms of writing style and visual presentation. To do serious work with it you'll of course need a board and/or database program to review the material, but it can be followed along with only moderate effort on a first read-through. The Leningrad Dutch is a tactics-heavy and sometimes tricky opening, one in which the theory of individual lines (or even whole variations) can change relatively rapidly based on new games and ideas. This book should not be used for the latest theory, but that's not its intent: it's designed more to present key ideas, themes and specific reasoning behind the highlighted lines, at an intermediate rather than advanced level. It does this the best of all of the Leningrad Dutch books I have looked at. If you have a coach familiar with the Leningrad, then this book is probably redundant, but for those of us without coaches, it can be quite helpful in getting to the next level of understanding about the opening and its middlegame ideas, something which McDonald emphasizes in the complete annotated games that the book is built around. He makes the effort to highlight similar plans and themes across games (including things like the ...f4 thrust and the utility of ...Nf6-h5 in attacking situations), which will be very important to achieving practical success using the opening. The main line treatment with 7...Nc6 is welcome, but it's also limited to Black's response 8...Na5 (after 8. d5 is played). So the other main alternative 8...Ne5 is completely ignored (unlike in the Starting Out book), which means if you are a Black player, you really should take a look at it as well as 8...Na5, given some (known) difficulties there. GM Viktor Moskalenko's related observations and analysis in The Diamond Dutch are very useful in understanding the trade-offs between the two lines.